Jump on over to Facebook some time today, and there’s a pretty good chance you’ll encounter an ad for the hottest Internet Marketing fad going – online lead funnels. If you’re a business owner or marketer trying to grow your business I can pretty much guarantee you’ve seen this pitch – maybe you’ve even purchased a course or webinar promising to teach you how to make it rain leads – no matter what business you are in. The graphics promoting these magic solutions often contain numerous boxes and arrows and combat themed phrases like trip wires and lead magnets all designed to help you attract, sort, segment, score, and manipulate your prospects into submission – oh, and did I mention you can do this from the beach? Now, I’m not opposed to generating lots of leads, but here’s the problem with this fad. You don’t want leads; you want customers. Most businesses aren’t trying to fill a course or sell an info product. Most businesses just need a handful of the right new clients on a steady basis. So, falling hypnotically in love with an autopilot lead funnel consisting of 437 simple steps just might not be the right approach at all. Oh, it sounds enticing, and, what the heck, everyone’s doing it, but just stop and think about all of this for a minute. 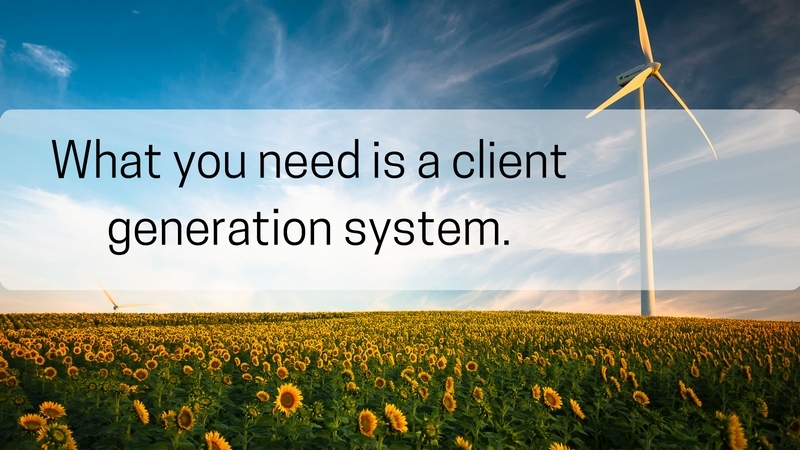 What you need is a client generation system. I work with a lot of independent marketing consultants and most them simply want to work with about ten of the right clients at any given time. With the math above it will take you 24 sales meetings to get the additional six clients needed to fill your practice and meet your revenue objectives. So, in building a lead generation and conversion system there are two primary questions. What does it take to get a consistent flow of appointments and how can you convert more appointments to clients. Build a system that does that, and you won’t need to worry about all of the lever pulling elements and moving parts in most lead funnels today. If you need six clients, build a system that gets you in front of 10-12 qualified prospects, and you’ll land six clients in a matter of weeks, it’s that simple. Below you’ll find the ten steps involved in creating a customer generation system for your consulting business. The very first step is to determine your revenue goal for the year and go backwards to determine how many clients you need to reach that goal. Then break it down to determine how many meetings, proposals, and pitches you need to make to hit that goal. Goal – $250,000 in revenue in 12 months means that if you sell a $500, $3000, or $5,000 service, you will need either 42, 7, or 4 clients respectively to reach that goal. Of course, it’s my hope that you have a pretty good idea of who makes an ideal client for your business but if not keep this in mind. At first target the group you can help the most, the fastest. The reason I advise focusing on this group is that you’ll probably be able to demonstrate how you can help them easily and by getting quick results, build some raving fans. For example, as a marketing consultant, I can use a set of tools that can show me how badly a business needs marketing help. It’s a matter of auditing their online presence and matching it with a few other bits of data such as industry and even local reputation or groups they might belong to. Now it’s time to create a valuable piece of content that will resonate with your target audience. Most likely this will come out in the form of a blog post. You may have some ideas about the kind of content that will attract your target audience if you want to make sure this one piece of content is the workhorse you need for your system, spend some time researching the questions and problems your target audience experiences the most. You can start with a tool such as keywordtool.io to identify the most frequently asked questions around a subject. Then move to a forum search by typing forum+your keyword topic (this can be an industry, i.e., forum+chiropractor), and you’ll find forums where your target audience hangs out to ask questions and get advice. The data from both of these sources may prove invaluable as you search for hot topics for your blog post. Finally, when you think you have a couple of solid ideas, take your topics to BuzzSumo, and you’ll discover a list of the most shared content for each theme. You can often use this information to determine a very hot topic and ideas for how you could create an even hotter post on the topic. Once you know who you want to target you can usually buy or rent a list based on demographics and location if you don’t already have a list you’ve collected. You could also append this list with some other elements such as members of an association or community group if want to refine it further. If properly targeted this list doesn’t have to be very large either. Now that you have an audience ready to target you can create Facebook ads driving people to your workhorse piece of content. In fact, if you don’t even want to go to the trouble of creating ads you can simply point to your blog post in a status update and “boost” your post to the custom or lookalike audience you created. This means the post will show in your timeline and show up as sponsored post in the timelines of those you’ve targeted. It’s standard practice for any content, but make sure your post has a large image that pertains to the topic. This will help it stand out. The key to making this kind of promotion work as the first step in customer generation is to add what is called a “content upgrade” to the post. A content upgrade is simply an offer for related, but perhaps a different form of, content made inside the blog post that entices those that visit to exchange an email address to receive the upgraded version of the content as well. The reason this is such an effective form of list building is that the person responded to your ad in the first place because the specific topic appealed to them. Once they visited and found the content was solid they are much more inclined to trust you to deliver something even greater. Your content upgrade can be in the form of a checklist, ebook, or even a video. As you can see this post has a form of content upgrade offer above, but in this case, I’m not asking for any sign-up. Your content upgrade should come with an ask for an email address so that you can respond with more information. We use the Thrive Leads plugin to create all of our content upgrade and subscriber boxes in our content. Once someone responds to your content upgrade offer, simply reach out and offer to provide a valuable service for no charge as a way to demonstrate how great it might be to work with you. For example, as a marketing consultant, I might use a few tools to run an audit on their online presence and quickly show them a few glaring weaknesses or places where a competitor has apparently invested and is benefitting. I could even spin up a nice looking report and offer to simply mail this to them with a further offer to sit down with them and go over a plan of action for improving their current marketing situation. If you’ve targeted and educated your prospect in this manner, then you are no longer creating demand and selling your harvesting demand and teaching. As you deliver value and move to an appointment, you want to make sure that your prospect is fully qualified to move forward with what you are going to propose. We use a series of “Discovery” forms that help us understand the prospect’s objectives, goals, and potential challenges. This tool not only helps us learn more so we can deliver more, but it also places a hurdle that might not be approached and scaled by someone that’s not serious. You can do a lot of free consulting if you don’t target and educate properly. This doesn’t mean you only help those who are ready to buy; it means you only expend the precious time and specific knowledge you have with those who need and appreciate what you have to offer. Once you’ve established a need and qualified for fit, do the research required to over deliver on what you promised as you set the appointment. Run your reports on their online presence, use one of the many research tools to teach them about trends in their industry, give them a full rundown on their competitors, and map out the priority initiatives you see them needing to address right now. For me there are two very significant ways to help our clients get more business immediately – increase the number of leads they are converting and do more business with existing customers. These are the two areas I’ll address to show them how they could get more business now as we go to work on building a steady stream of new leads and clients. Now you’ve done the research, and so you assume you have all the answers and the entire plan and you’re simply going to “show up and throw up” as I’ve heard more than one sales trainer describe it. The key to engagement in this form of lead harvesting is to help the prospect tell you in their words what’s wrong and what not fixing it is costing them. Get them to dream a bit about where they want to go and what they think it might take to get there before you prescribe anything. Once you have them engaged in their story, you can start to talk about quick wins they could they could realize if they did one or more of the things you have in your plan – remember now it’s solely based on what they are telling you. Then you can stretch and talk about more things that could be done long term to get the solid gains over time. This near-term vs. long-term vision is important to help your prospect see the road ahead and how they get both immediate and lasting change from working with you. If done properly you simply need to ask them if they would like to achieve these kinds of gains from working with you. While there are a few things you need to get in place initially and few moving parts you’ll want to test and tweak as you go, a customer generating system doesn’t have to be that complex, it simply needs to be based on your overall growth needs and goals.